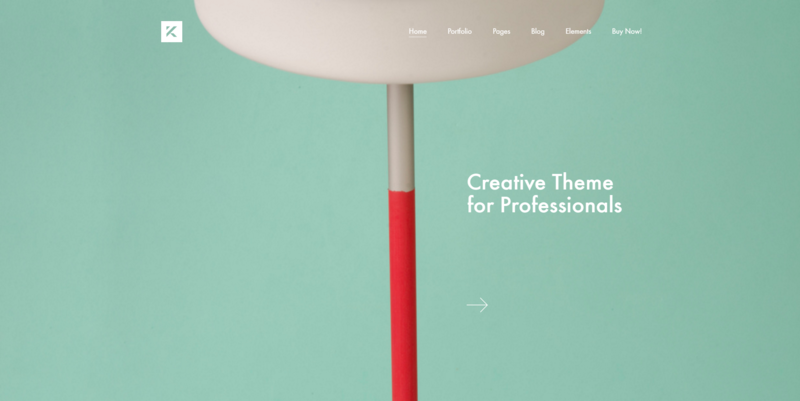 Kalium is a creative and portfolio theme, developed in April 2015 by Laborator, an Envato Power Elite author. With a considerable number of options, portfolio styles, custom elements, lightbox and hover effects, the multi-purpose category is a more suitable one to include this beautiful template in. Whatever your plan is, Kalium can be the right choice for your photography, personal or blogging website. Crafted as a minimal and creative theme, Kalium mixes the impressive design with a clear architecture to help you build and organize an excellent site. 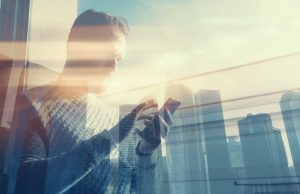 Responsive and retina ready, Kalium comes with an adaptive images system that detects the screen size of your device to ensure the high-quality experience for any visitor across all devices. As a clean and crisp, creative WordPress theme, Kalium comes with 11 demos ready to be installed on your site with a single click. With the demo import system, pre-built layouts like Agency, Fitness, Architecture, Freelancer, Education, Store or Photography are ready to transform the design of your website in a few minutes. Choose the demo you like and load it on the site. You can customize it using the available options and build the website of your dreams. Even if there are no pre-defined header styles, you can set up a static or an absolute position of this section and integrate it into your page, to make it even more eye-catching. Whether you extend the header section with the full-width option or not, the ‘Above the fold’ area will surely be a hit. For the footer area, you can set up as many social networks as you want. 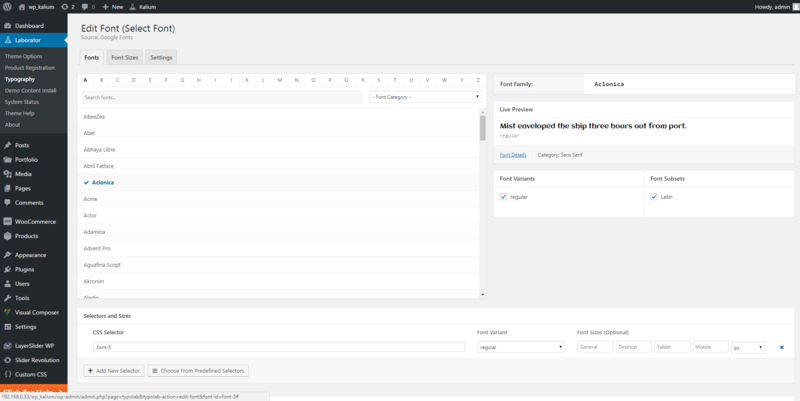 Also, if you choose to show the footer into columns, you can add up to six widgets per column. In Kalium you can choose between different layouts to customize your main menu area. Each menu type can be styled using predefined color skins or customized with the particular color you want to use for the brand consistency. This theme allows you to create a wonderful blog or shop page which includes sliders or content designed using the premium page builder – Visual Composer plugin. When you build a post, you can add a standard, video, quote, image, link, gallery or audio format. Also, on each post or page, you can make individual adjustments for featured image placement, size, menu and so on. These additional customization options make your website more appealing visually and engaging to your visitors. With nine post styles, combined with many opportunities to mix headers with logos & menus, you can craft exactly that appropriate context for each post. 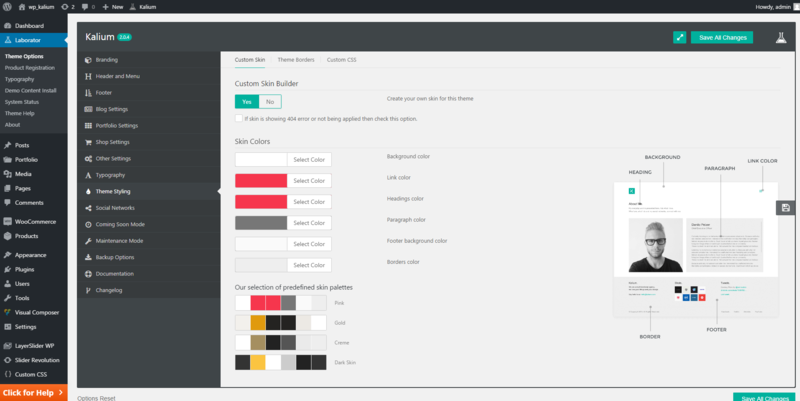 Kalium comes with many color options, including a custom skin builder which helps you choose and use the colors you love for header, background, border, links or footer, and then save them as patterns for your website. You can add a final touch to your pages with one of the two pre-built footer styles. Customize this area with text, fade animation or a slider. With this template, you can add custom, Google, Squirrel, Premium and Typekit fonts. The author included a live typography preview to help you choose the right font for the website’s sections. Since the Laborator developers have included a player option, you can list your favorites audio tracks or videos and share them with your visitors. You can apply a minimal or a standard skin with options related to preload, loop or autoplay video options. Kalium allows you to showcase your impressive work in styled Portfolios created using the drag and drop page builder and dedicated options. You can choose a different type of slide, columned, carousel, zig-zag, full screen or lightbox to style each portfolio, individually. If you want to set up a global portfolio layout, you have three options available in theme’s options panel. Your visitors can share posts and portfolios with their friends on the favorite social networks as the theme is social-friendly. Facebook, Twitter, Pinterest, Linkedin, Google Plus, Vkontakte and other accounts can be linked to your website. 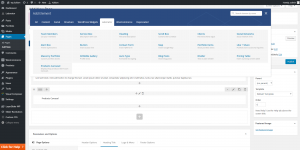 Kalium comes with a well-structured theme options system called the Laborator Panel. If in previous versions the panel was placed in Appearance on Dashboard, in the latest major update (2.0), all the template’s global settings were moved up on the page to be more accessible. 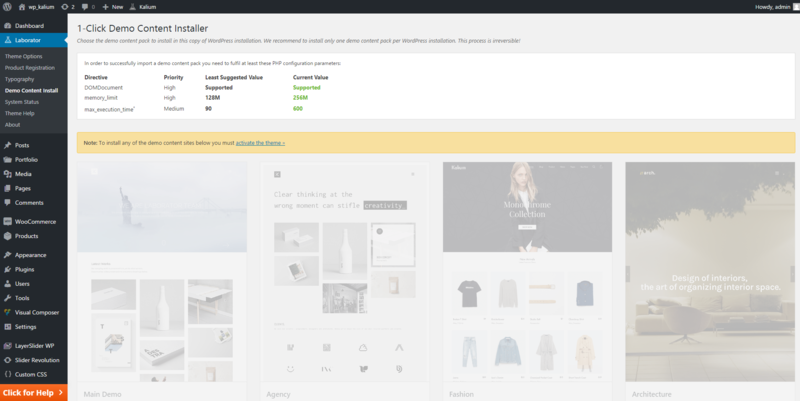 Whether you want to change the Theme’s Options, Product Registration, Typography, Demo Content Install, Help or you just need to check out the About section, with the new panel placement, it’s now easier to make adjustments. The theme is powered by the drag and drop page builder, Visual Composer plugin. 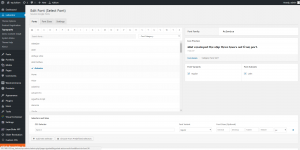 You can use this page builder on both backend and frontend interface. With 19 custom built elements, it is easy to create pages. 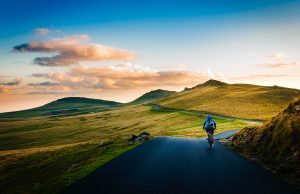 The Team Members, Service Box, Dribble Gallery, Social Networks or Products Carousel are a few of these items you can customize and introduce them into your pages. Another new and exciting feature that is available in the most recent versions of the Kalium is an intuitive system to help you customize the typography, the ‘Ultimate Font Management Library’ – TypoLab Fonts, but it’s rather a font builder. This management system allows you to setup the fonts, sizes for header & footer, paragraphs, menus, portfolio or shop sections. You can also set the default placement for the font import in HTML document, a preview text in pixels and more. It is a great tool that contains advanced typography settings and allows you to preview the wanted Google, Font, Premium, Adobe Typekit or Custom Fonts. If you want to work on the backend of your website in an offline manner, the Kalium theme offers you the option to customize a ‘Coming soon mode’ page. You can set a countdown timer, custom background image and a logo on this particular page to announce when your website will be ready. You can insert the title, description and the text, and show the social networks. A handy feature is that you can just quickly write a color name (red, blue) and it will apply immediately, without a color picker or a specific code. Besides the Coming soon page, the authors give you the possibility to set up a Maintenance Mode page, while you’re improving the website. These two predefined pages are important, and won’t slow down your site like any external plugins might do. The theme comes bundled with premium plugins like Product Size Guide WooCommerce, Revolution Slider, and Layer Slider. Kalium is compatible with WPML, WooCommerce, Yoast, Ninja Forms, WP Super Cache and ACF plugins. With Kalium you can build an online store, as the theme comes with many eCommerce options. Other free plugins like ACF Flexible Content Field, ACF Repeater Field, ACF Gallery Field, and Sidekick also come bundled with this template. You can use them to enhance the functionality of your website. Kalium is designed to help you customize your theme files without modifying the main theme. You can access the child theme from the installation package and start making code adjustments. Since the 2.0 template version was released, Kalium is RTL ready. We have tested Kalium default demo on different page speed tests, and the content loads at a medium speed. You have to log into Envato API and choose the valid purchase code. 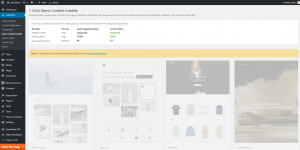 It could be much easy for the user just to type down the purchase code, without having to access the Envato Market. For now, Kalium doesn’t work with banner or AdSense ads. 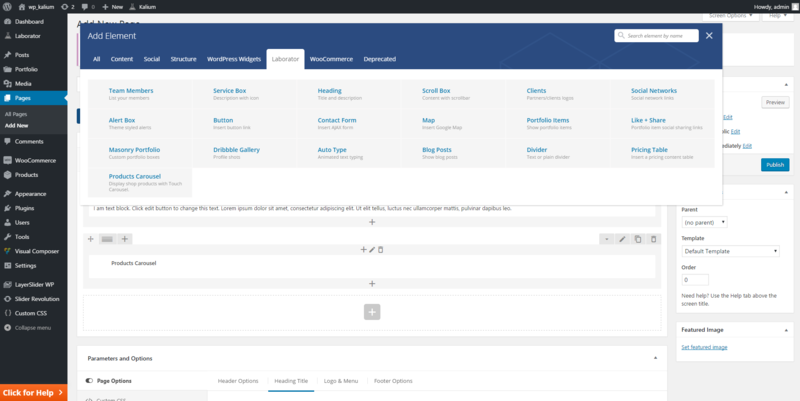 The version 2.0.4 of the Kalium theme is a more user-friendly interface, giving you the option to build an attractive website. With adaptative images, color skins, custom typography, portfolio items opened in lightboxes, pre-made demos, and no coding knowledge required. 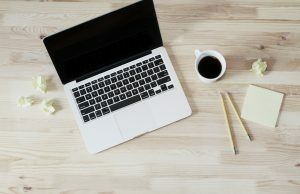 Every WordPress user could manage this template and develop a creative, photography, personal or blogging website. Hi! I like the new Kalium! I cannot believe it’s not compatible with bbPress & buddyPress 🙁 I really hope they fix this soon! Hi, Denyz! Thank you for your message, it means a lot for us and for our visitors. Maybe in the future, the author will improve the theme’s compatibility with the popular plugins. Good luck with your project! I have installed this theme and this theme worths buying :). Thank you for the review! Hi! Thank you for your appreciation. We are trying to do our best to provide valuable information to our readers :).